Enter the world of the Military K-9 Unit. When the Red Rose Killer leaves his calling card for Staff Sergeant Felicity Monroe, she knows exactly what that means - she's on his revenge list. Her boss, Master Sergeant Westley James, and K-9 German shepherd Dakota become her guardians, but they'll have to act fast to escape the man who wants her dead. 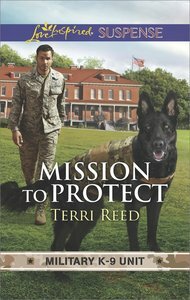 About "Mission to Protect (Military K-9 Unit) (Love Inspired Suspense Series)"